With collector car auctions popping up like daffodils in the spring (although some of them might better be likened to stinkweed in the swamp) reporting on even a cross-section can be arduous. The Scottsdale auctions in January are a case in point, but the proliferation is better seen at Amelia where there were five overlapping auctions in the space of just three days. Getting a sense of what’s going on means dashing from place to place in a near-frenzy, trying to find cars representative of collecting, the evolving market and the individual auctions and committing them to photos and a written record. 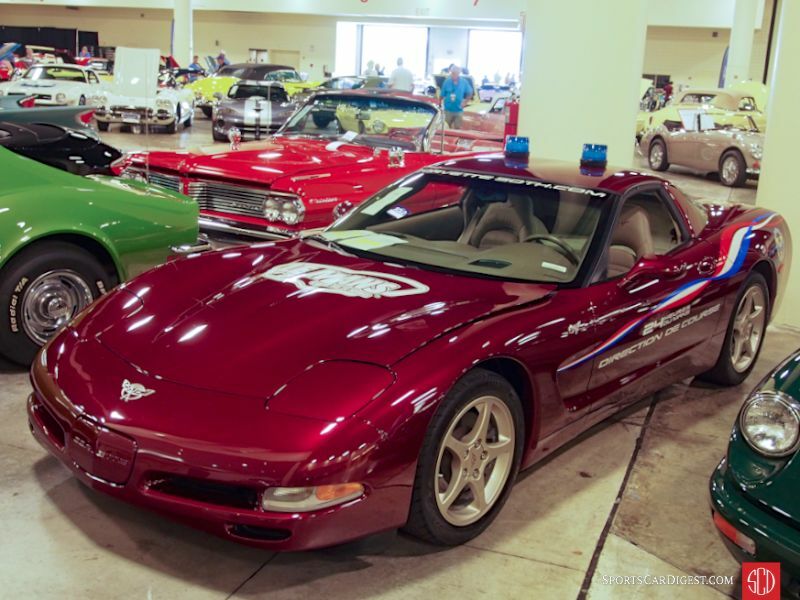 Then along comes a weekend in Ft. Lauderdale at Donnie Gould’s Auctions America. It was a breath of fresh air. It helped that I got to stay with friends, John Kyle and Kristina Bruni and their three delightful children. 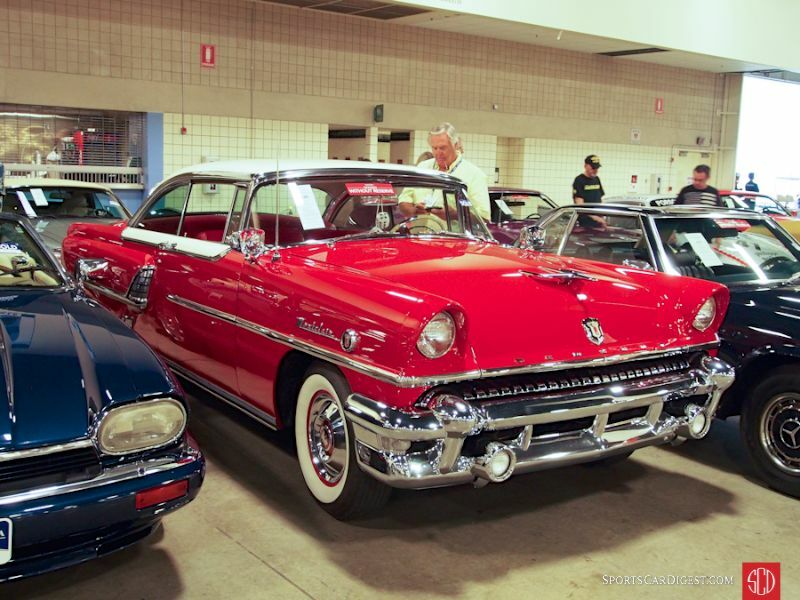 But it was the Auctions America event at the Broward County Ft. Lauderdale Convention Center that made the difference. The cars were – and this is an impression uniformly shared by the usual suspects who populate collector car auctions – consistently interesting, good quality and often downright rare and unusual. That’s not to say that all of them were pristine, but even the ones that weren’t had something to commend them to collectors of various stripes. Usually, to try to capture a cross-section of an auction, I will notice a particular car, then look around it for, usually, two or three more that say something about collecting and the collector car market. At Auctions America Ft. Lauderdale I’d have six or eight in the immediate vicinity that fit the bill, so many that I ran the risk of getting ahead of myself taking photos. It turned into a thoroughly enjoyable three days, and reminded me why I do this and why I like the cars and the car auctions so much, just for the shear diversity of impressions. It was the antithesis of the hustle and pressure of Scottsdale, Amelia and Monterey, three days of having fun poking at and writing about fun cars. At the end of the day my feet hurt just as much, but they were happy feet. There were sub-$10,000 cars that looked solid and would happily have introduced newcomers to the pleasure (and pain) of owning an old car. There were six-figure classics that would hold their own on any concours lawn or CCCA tour. Many of the cars were offered with reserves at a time when the high end catalog auctions won’t take anything under $200K with a reserve. Having a reserve is essential to most collectors, for whom the prospect of having their honest $30K car fail to find an appreciative audience in a no reserve auction and changing hands for $15K to a bottom-feeder is heart- and bankbook-breaking. With a 68.9% sell-through the presence of reserves on 17.6% of the cars seemed to have little effect, except on owners’ willingness to consign, and it adds honest, cared for, collector owned vehicles to the docket. It was a marvelous three days, gearing me up for the rest of 2016 and making car collecting affordable and approachable for new collectors. 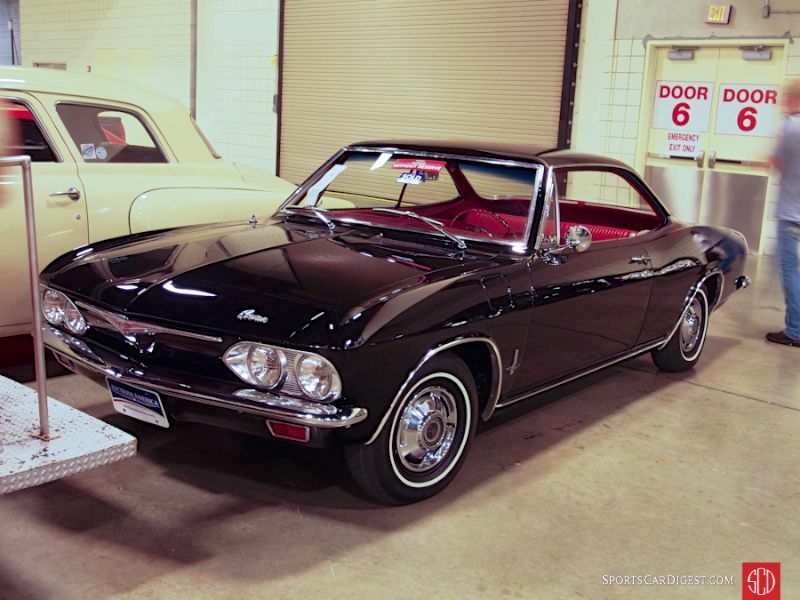 Lot # 120 1965 Chevrolet Corvair Monza 2-Dr. Hardtop; S/N 105375W215211; Black/Red vinyl; Estimate $12,000 – $16,000; Visually maintained, largely original, 3 condition; No Reserve; Hammered Sold at $7,000 plus commission of 10.00%; Final Price $7,700 – 164/95hp, Powerglide, bucket seats, wheel covers, narrow whitewalls, pushbutton radio. – Quick old repaint over old paint and chips. Sound original interior. Bumper chrome is redone but trim is weak and stainless is scuffed. Crisp, sharp gauges, good steering wheel. Wheelwells have been repainted over old undercoat. Engine is dry but original. About what is expected for a Corvair. – ‘Overlooked’ hardly begins to describe Corvairs but they are one of the poster children for the concept that it doesn’t have to be expensive to enjoy collecting cars. This isn’t a great car, but it is far better than most Corvairs and it is nothing if not realistically priced in this transaction. Lot # 131 2003 Chevrolet Corvette Coupe Le Mans Course Car; S/N 1G1YY22G135109035; Anniversary Red/Beige leather; Estimate $42,000 – $45,000; Unrestored original, 2- condition; With Reserve; Post-block sale at $38,636 plus commission of 10.00%; Final Price $42,500 – 350/350hp LS1, automatic, full road equipment, working safety lights, heads up display. – Like new except for lightly used seats. Negligible miles, but not getting better with age. One of two Course Cars used at Le Mans, formerly in the GM Heritage collection. – Sold at Barrett-Jackson in Palm Beach in 2005 from the GM collection for $62,640, then at Mecum’s Kissimmee auction two years ago in 2014 for $35,100. Essentially unused and an intriguing snippet from Corvette history. The ’05 buyer took a bath but now it’s reached a reasonable level consistent with its history, condition and mileage. Because of the track’s length Le Mans breaks its full course cautions down into groups of which this car led one. Among Corvette 50th Anniversary Editions it is a significant vehicle with unusual history. 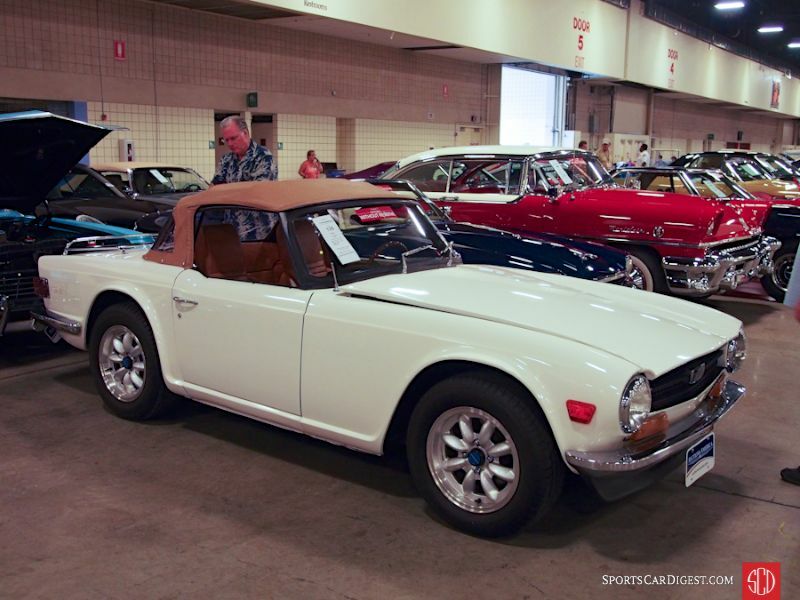 Lot # 135 1971 Triumph TR6 Convertible; S/N CC55951L; OE White/Tan vinyl; Tan leatherette top; Estimate $12,000 – $17,000; Cosmetic restoration, 3 condition; No Reserve; Hammered Sold at $13,500 plus commission of 10.00%; Final Price $14,850 – 2498/106hp, 4-speed, JVC cassette stereo, Panasport alloy wheels, Barum blackwall radial tires, luggage rack, woodrim steering wheel. – Orderly redone engine compartment but original frame and chassis. Good recent repaint with a fresh chip over the left front wheel. Good interior and top. – A sound, usable and presentable TR6 bought for a realistic price that’s fair to both the buyer and the seller. Lot # 146 1955 Mercury Montclair 2-Dr. Hardtop; S/N 55WA15964M; Red, Cream roof and accent/Red, Cream vinyl and cloth; Estimate $30,000 – $40,000; Cosmetic restoration, 3 condition; No Reserve; Hammered Sold at $21,000 plus commission of 10.00%; Final Price $23,100 – 292/198hp, automatic, dual remote spotlight-mirrors, wheel covers, wide whitewalls, continental kit, pushbutton radio, heater, power steering, power brakes. – Good paint and interior, sound but scuffed chrome. Restored engine compartment. Frame and chassis restored with a steam jenny and a spray gun of chassis black. Mercury letters on the hood are loose. Cosmetically done to cost-conscious standards and showing it, but holding up well. – Sold at Dave Rupp’s Ft. Lauderdale auction in 2007 for $37,800. The buyer tried to Get Rich Quick and turned down $43,000 three months later at Branson Spring, then $41,000 at Branson Spring in 2009. This is what it’s worth today and it is an attractive piece of Fifties American automobile history at that price. 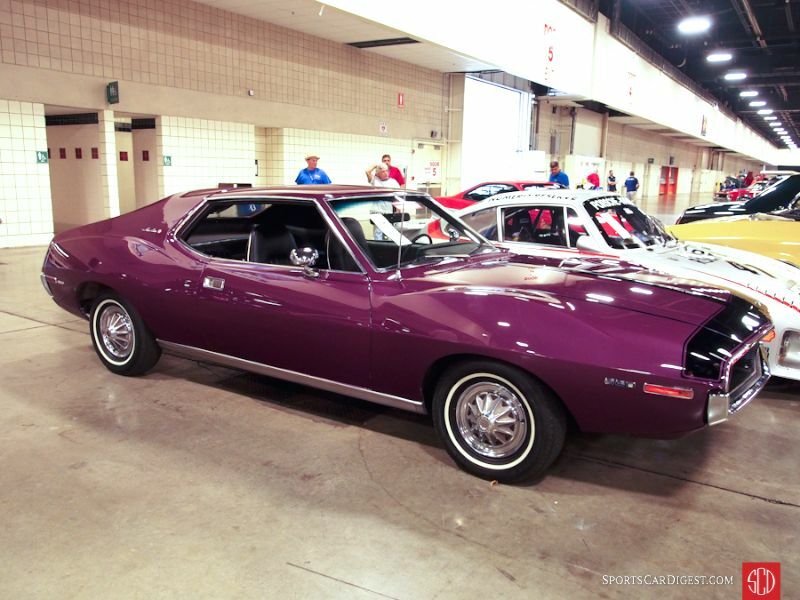 Lot # 158 1971 AMC Javelin SST 2-Dr. Hardtop; S/N A1C797N254360; Purple, Black nose band/Black vinyl; Estimate $10,000 – $15,000; Visually maintained, largely original, 3- condition; No Reserve; Hammered Sold at $9,000 plus commission of 10.00%; Final Price $9,900 – 360/245hp, automatic, power steering, power brakes, pushbutton radio, wheel covers, narrow whitewalls. – Sound but microblistered paint applied over old paint. Weak chrome, scuffed stainless. Good original interior, dash, gauges and switches. Original underbody and engine compartment with a repainted engine. Done to competent driver standards appropriate to its basic engine and automatic transmission. – This is another of a number of examples in Auctions America’s Ft. Lauderdale sale of affordable, enjoyable, distinctive starter cars that provide entry-level access to car collecting. The price is right-on for the Javelin’s equipment and condition. 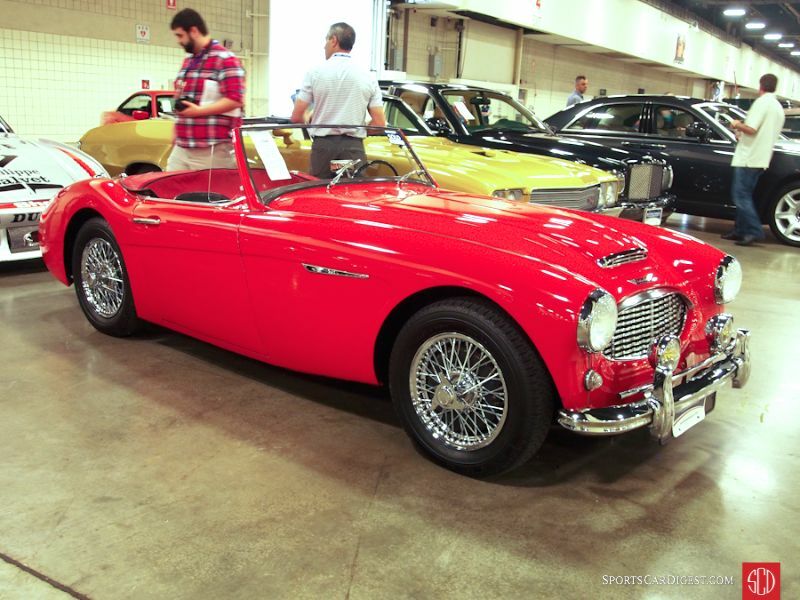 Lot # 159 1959 Austin-Healey 100/6 Roadster; S/N BN6L2142; Red/Black vinyl; Estimate $40,000 – $50,000; Cosmetic restoration, 3 condition; With Reserve; Hammered Sold at $31,500 plus commission of 10.00%; Final Price $34,650 – 2,639cc/117hp, overdrive, chrome wire wheels, Michelin XZX tires, Marchal fog lights, wind wings, heater. – Boot lid interferes with the bumper overriders. Paint, interior and chrome are good. Underbody is original with a respray with chassis paint. A driver quality Healey. – Sold at Hershey in 2007 for $40,500 in a transaction early in the recently concluded Big Healey boom, then sold here a year ago for $36,850 and now down a little more in a transaction that delivers good value for the money to the new owner. 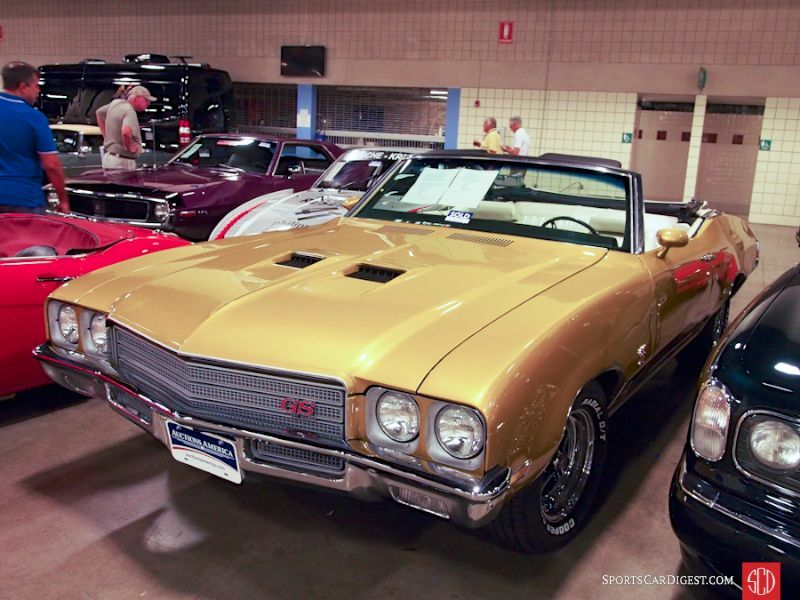 Lot # 161 1971 Buick GS 455 Convertible; S/N 434671H204676; Gold/Pearl vinyl; White vinyl top; Estimate $30,000 – $40,000; Older restoration, 2- condition; With Reserve; Hammered Sold at $32,500 plus commission of 10.00%; Final Price $35,750 – 455/315hp, automatic, power steering, power brakes, air conditioning, Magnum wheels, Radial G/T tires, pushbutton radio, dual remote outside mirrors, N25 exhaust. – Very good clearcoat repaint, excellent upholstery. Good major chrome but dirty, oxidizing wheels. Underbody was done, but is dirty and bare steel fittings are surface rusty. Stainless trim is lightly scuffed. Restored to showroom condition a while ago, now showing age and perhaps not the best preservation of the restoration which was said to have been done last year but looks significantly older. – One of 902 GS convertibles built in 1971, a pleasing combination of a big engine, folding top and the A/C that is essential here in Florida for year-round use. Buick luxury and 455 performance makes this an appealing acquisition and one that is in this transaction moderately but appropriately priced. 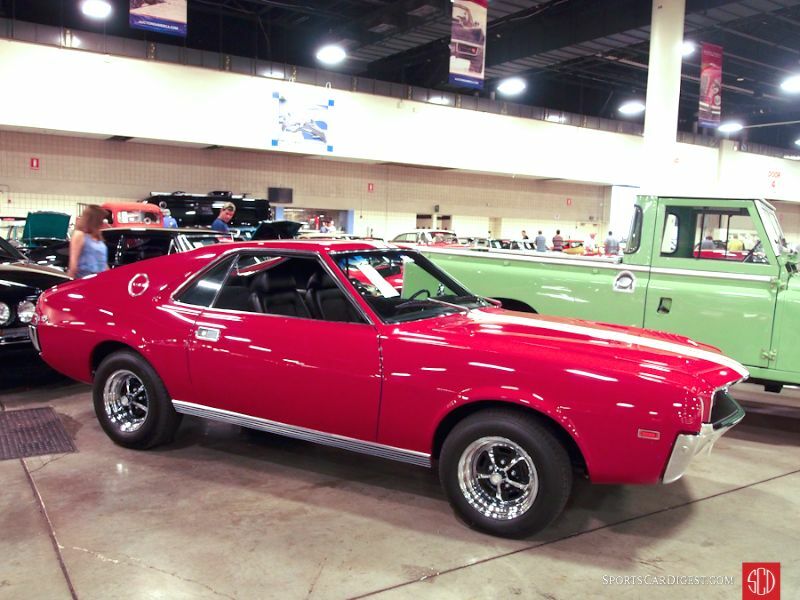 Lot # 199 1968 AMC AMX 2-Dr. Hardtop; S/N A8C397X283695; Red, White stripes/Black vinyl; Estimate $30,000 – $50,000; Cosmetic restoration, 3 condition; With Reserve; Hammered Sold at $24,000 plus commission of 10.00%; Final Price $26,400 – 390/325hp, 4-speed, pushbutton radio, no console, Magnum wheels, Radial T/A blackwall tires. – Poor quality repaint with fisheyes and dirt inclusions, not finished around the cowl vents or windowsill trim. Lightly scuffed stainless trim. Good interior and gauges. Chassis and underbody quickly redone to adequate driver standards. Definitely driver quality and not particularly reassuring. – The high compression optional 390 engine is particularly attractive, but the caliber of the restoration isn’t. This is an auction car and the Ft. Lauderdale bidders recognized it for what it is and paid accordingly. A wonderful writing style that brings humor and wit with cold hard facts to each vehicle description! I look forward to Rick’s auction reports. He has great insight into what the market is, keen eye for the vehicle condition and a knack for some humor. His remarks about sitting an OK vehicle outside a mediocre restaurant to give it class is priceless. Good job! Love the Earl Scheib reference. Checking Google, surprised the name is still being used given that it became synonymous with quick/cheap/bad paint jobs. ….and that was with everybody, not just car people.